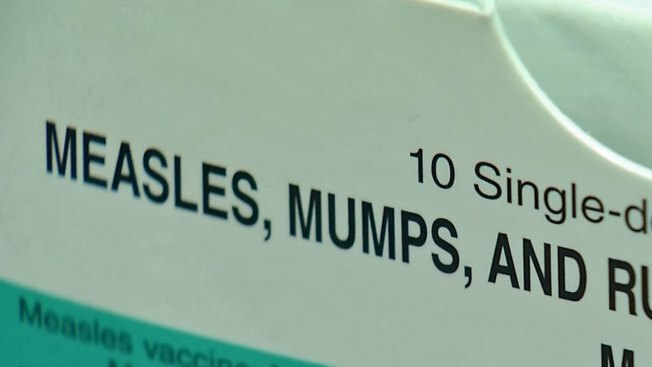 San Diego County health officials have confirmed the sickness that shut down a La Mesa urgent care Wednesday was indeed measles, tied to an outbreak at the Disneyland resort. Seven new cases surfaced in the county this week, bringing the total of confirmed instances to ten. Six siblings visited the Sharp Rees-Steely Urgent Care in La Mesa on Wednesday for measles symptoms, and once employees found they had the telltale rash, they temporarily closed the facility. Tutu-Clad Suspect Suffers "Transvestic Fetishism": Atty. On Thursday, health officials said a person "closely connected" to the family also had measles. Two of the six infected siblings had visited Disneyland between Dec. 17 and Dec. 20, 2014, when more than two dozen people from four states caught the disease. CVS Pharmacy, 2760 Fletcher Parkway, El Cajon, Jan. 14 from 4 p.m. to 7 p.m.
Vons, 2800 Fletcher Parkway, El Cajon, Jan. 14 from 4 p.m. to 7 p.m.
Rite Aid Pharmacy, 1665 Alpine Blvd., Alpine, Jan. 13 from 4 p.m. to 7 p.m. Trader Joes, 5495 Grossmont Center Drive, La Mesa, Jan. 12 from 4 p.m. to 7 p.m.
Absolute Personal Fitness, 2000 Main Street, Julian, Jan 9 from 5 p.m. to 7 p.m.
Julian Fitness Center, 2216 Main Street, Julian, Jan. 9 from 5 p.m. to 7 p.m.
"This is extremely scary, especially when we come here a lot since we live right across the street," said Vons shopper Lucie Cishugi, who was visiting the El Cajon grocery store on Thursday. Others, like shopper Ashton Lawrence, were not as concerned. "I know I was vaccinated, and I tend to stay pretty healthy," said Lawrence. The HHSA says none of the locations has a current risk for measles. So far, no cases have been linked to those sites. Earlier this month, two other siblings reported coming down with measles after a trip to Disneyland. Health officers warned they may have exposed others at the Parkway Plaza Mall in El Cajon. The third confirmed case came to light on Tuesday. Only one of the local patients had been vaccinated for measles. A seventh case of measles, believed to be tied to the six other cases at a La Mesa urgent care center, emerged on Jan. 15, 2015. NBC 7's Steven Luke reports. Measles symptoms can develop seven to 21 days after exposure. Early symptoms include a high fever, cough, runny nose and red, watery eyes, according to the Centers for Disease Control and Prevention. Two to three days in, tiny white spots may develop inside the mouth. After three to five days, the distinctive rash begins to form. Measles has not been endemic to the U.S. since 1997, but health officers told NBC 7 they expect the number of California cases to grow as they confirm new instances of the virus. A local pediatrician called the outbreak "alarming" and blames the recent anti-vaccine movement for spreading a disease for which there is already an immunization.